For centuries, Mediterranean women - from classic beauty Helen of Troy to our own reel-time goddess Sophia Loren - have known the secret of healthy eating, living, and being. Mediterranean women have long embraced a natural vitality, sensual earthiness, grace, and warmth that allows them to be authentically themselves, to live long, spiritually rewarding - and thin! - lives, freed from empty calories, empty diet promises, impossible standards, and a say no to food mentality. Thanks to the influence of cooking lessons in her Italian grandmother's kitchen, Melissa Kelly, co-owner and executive chef of Primo Restaurant, revels in sharing how every woman can extract the essence of the Mediterranean spirit and make it uniquely her own. From the cuisines of the Mediterranean and the Middle East, women learn how to maintain a healthy weight even as they discover and delight in the Mediterranean approach to food: the joy of the colors, textures, aromas, and flavors. In addition, science now confirms that eating the Mediterranean way, getting most of the fat in your diet from olive oil instead of from meat and other sources of animal fats, is heart-healthy, immune-boosting... and, yes, slimming, too! Mediterranean is a way of living, a celebration of family and togetherness woven with pleasure, laughter, and sensual delight. Flavor, variety, abundance, love of family, and soulful adventure are what Mediterranean women embody. Chef Kelly helps women bring these traditional qualities of Mediterranean hearth and health into their own homes. 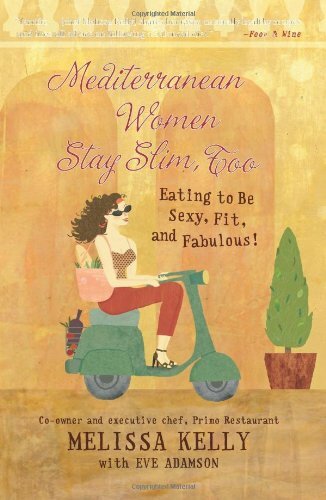 Overflowing with a cornucopia of more than one hundred diverse and mouth-watering recipes, as well as a detailed menu planner, Mediterranean Women Stay Slim, Too gives women delicious food to eat in the context of an easy-to-follow plan. While sampling everything from traditional Hummus to Quick-Cooked Salmon with Fall Vegetable Pistou, to exploring the complex and satisfying layering of flavors in Prosciutto, Fennel, and Pear Salad with Persimmon Vinaigrette, you'll join women in enjoying the timeless, artful Mediterranean way of eating well and living a long, sensuous, beautiful life. Opa!